This is a simple guide with lots of good stuff to inspire you, but at only 46 pages it won't take you forever to read; you'll be able to understand the concepts and jump right in! Some of the content is from a Christian perspective, but whatever your own beliefs, you will find lots here to help and inspire you. 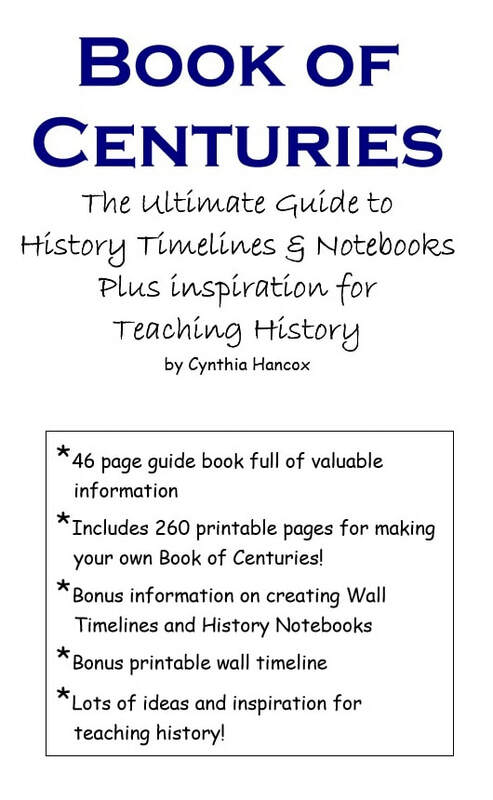 The Book of Centuries and/or Wall Timeline can be used with ANY curriculum or approach to teaching history! In the study of History, memorizing a lot of dates is not important; unless they have significant meaning to the student, they will soon be forgotten. The important thing about history is the PEOPLE - who they are, what they did, what they learned, how God worked in their lives, how their choices had consequences - both good and bad. Dates are just "hooks", useful to hang things on, and to help connect the various people and facts of history, into a cohesive picture. This is where timelines come in - by using them to record the people and events they have studied, your student will begin to make connections - to see what was happening in one part of the world while such and such was happening in another, to understand how different world events have a flow-on effect to other parts of the world, to see how things connect together, and where they stand in relation to the flow of time between past and present. A timeline pulls together all the bits of information and history that otherwise can seem unconnected and gives the bigger picture. And it's these connections that can really excite one about history, and also help you to remember all you have learned! A Book of Centuries is one kind of timeline record - a wall timeline is another. I'll teach you about both. Book of Centuries guide and printables only $19 for the set!